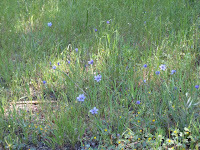 So I'm going to help a friend work on/design her front yard. 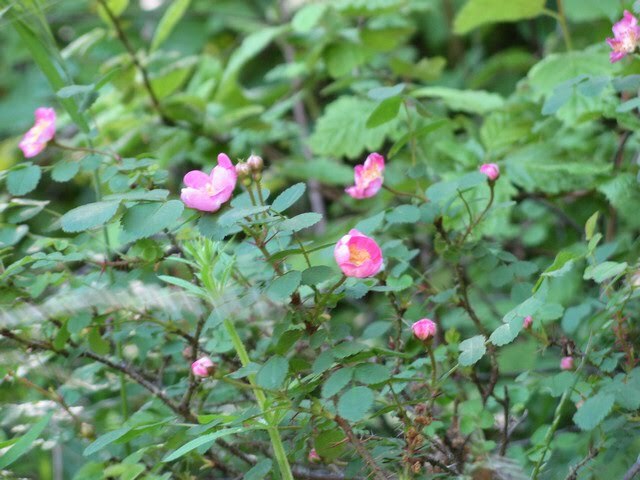 I can be a bit controlling, so I'm letting go and said my only rule is not planting any invasives. We all make mistakes and I've made a few, but we should really just obliterate some plants from our landscapes. 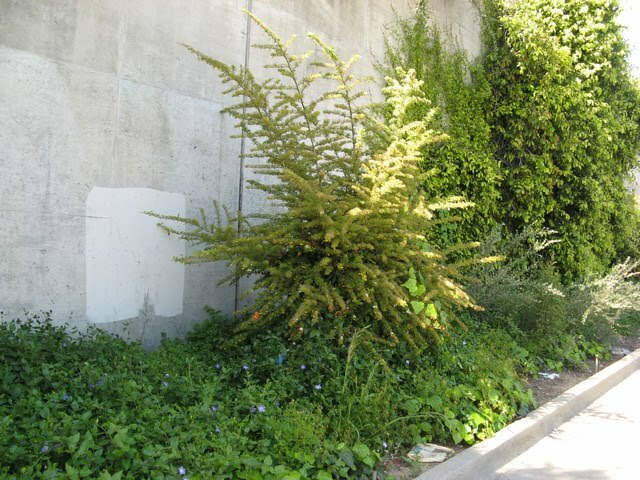 Here is a stretch of dirt along a wall outside the MacArthur Bart Station in North Oakland. 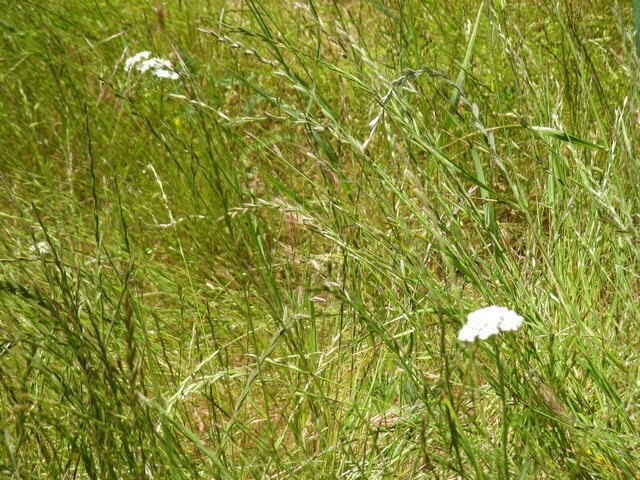 It contains 4 of our most invasive species all rolled into one tangled mass. Who will win? My bets are on the ivy. 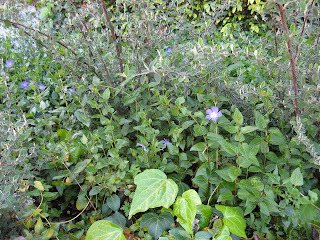 In the closeup you can see cotoneaster, vinca (periwinkle), and ivy. Not pictured is Himalayan blackberry. Why are these so terrible? Well cotoneaster makes big, thorny thickets and just seems to reseed all over the place thanks to the birds. Vinca will form a huge mat, keeping any other low-growing thing or seedling from growing. And ivy here in the East Bay tends to just blanket hillsides and swallow up shrubs and even trees. Not only do these guys spread, but they limit the diversity of plants in that area. 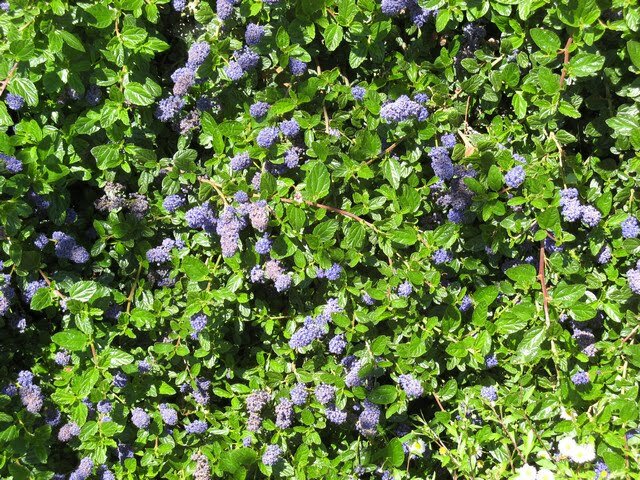 Instead of cotoneaster, plant toyon, a native plant that has similar foliage color and similar berries in the late fall/winter. 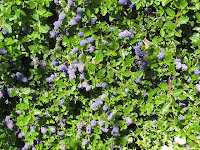 Though I think the toyon berries are nicer because they are a truer red, whereas cotoneaster berries have an orangeish tint. So toyon branches can make a nice Christmas decoration. 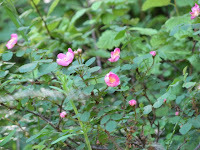 We actually have a native blackberry (Rubus ursinus). Why not plant that one? 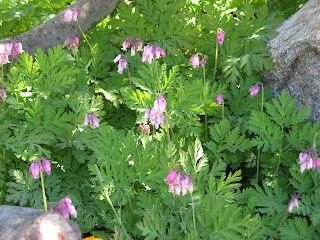 Or maybe ollalaberries, not native, but not invasive as far as I know. As for ivy and vinca, there are tons of groundcovers to choose from that will do the same job, but not get out of control. 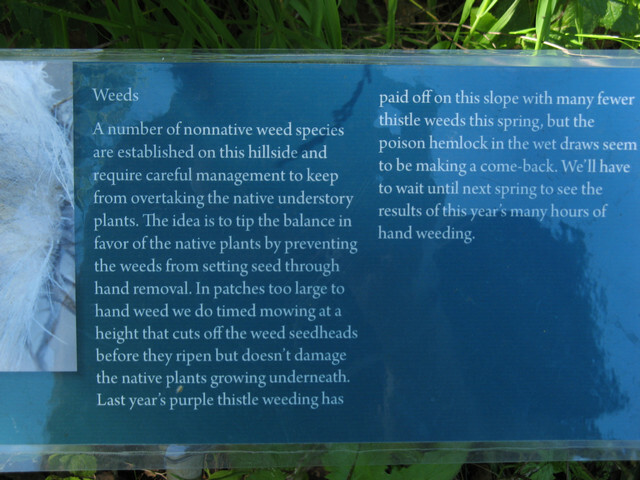 I'm by no means a native purist, but I think we should all agree to at least not plant things invasive in our areas. So I've been wanting to do a post about this for a while. 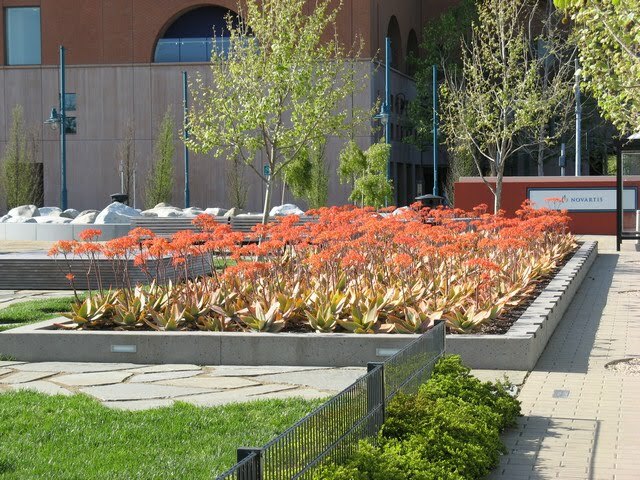 This is a small garden/park attached to the Novartis building in Emeryville on Hollis Street. It's pretty simple and maybe not my exact style, but it is definitely interesting. I drove by this place pretty regularly for over 2 years. Most of the year it's not too exciting. 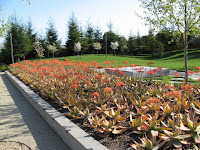 But in the spring, the aloes all bloom at the same time in one massive show of color. It's very eyecatching and it's a good use of a small space. 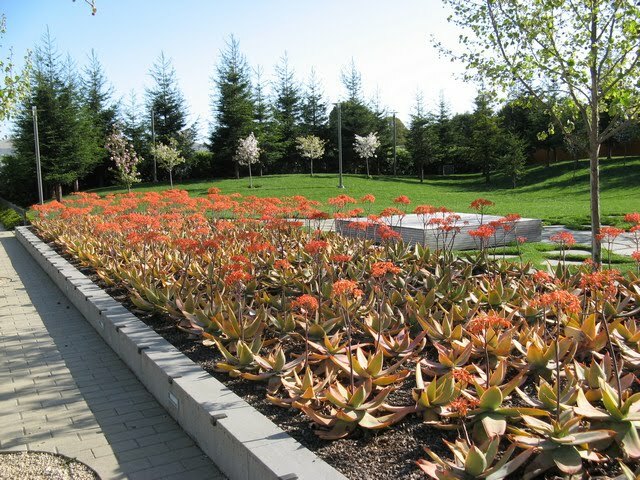 The Aloes are right on the sidewalk next to road and so draw your eye in to the mini park in an area that's otherwise, semi-industrial/corporate. And the trees blossom at about the same time, so there is more interest beyond. 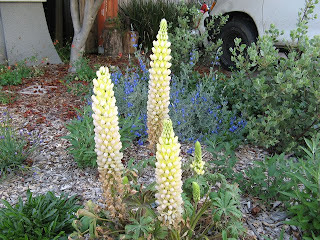 And also these other flowering succulents grab your attention further back. These add some contrast all year, but for most of the year it's not as magnetic. I do always think of this spring show when I drive by, regardless of the season. 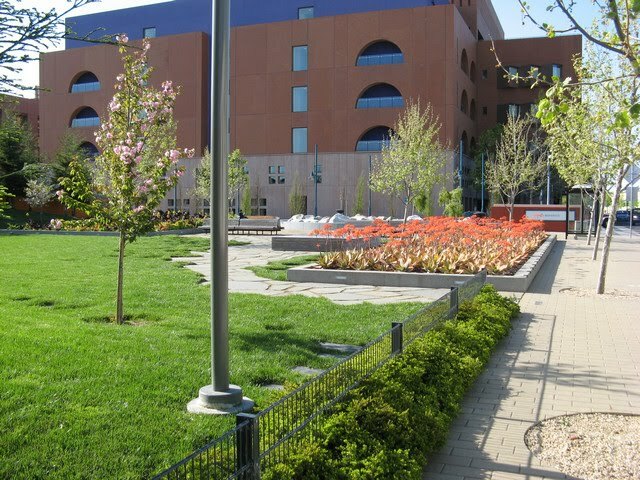 The redwoods along the outer edges are planted a little close and I think might cause problems in the future, but all in all a good use of some corporate cash. So I couldn't resist. 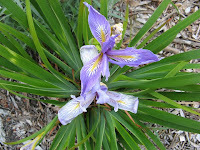 About 2 weeks ago, I went over to my last garden to see if the iris (Pacific Coast Hybrid I believe) had bloomed. And they had! 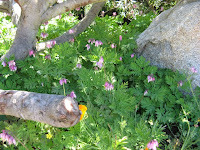 I had been waiting for them to bloom all spring and they hadn't before I moved. I was so excited to see them in flower, even though I don't live there to enjoy them. The next pic is a little hard to see, but the purple of the iris looks great with the white of the snow-in-summer. And just 2 days ago I went to see if the native honeysuckle had bloomed. I feel like an addict, I just can't get enough. It was the last plant in the front yard that hadn't bloomed. Well that and the Rocky Mountain penstemon, but I've give up on those. 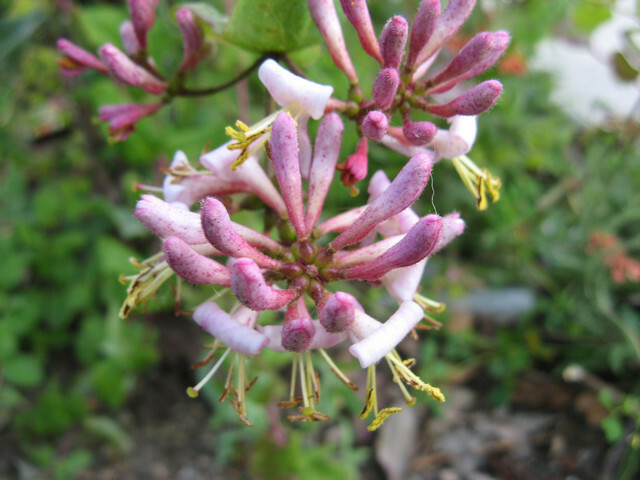 Well the honeysuckle has finally bloomed as well. 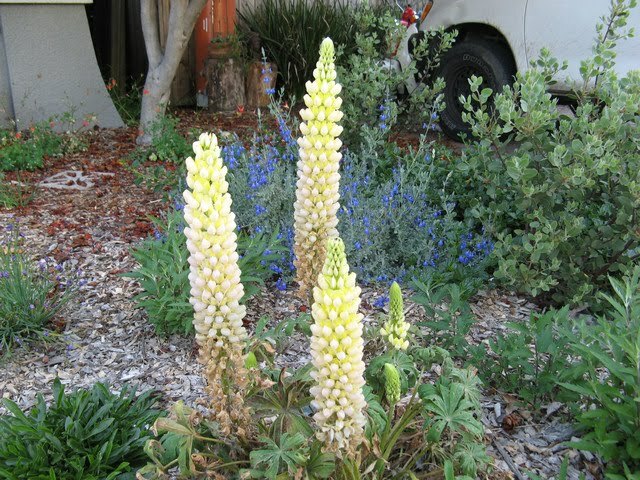 There were other surprises as well, like this yellow lupine with Salvia chamaedryoides in the back. Or this guy. I'm not sure what it is. 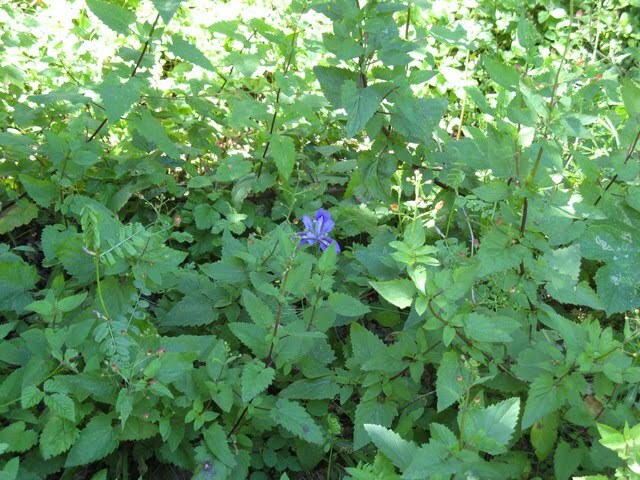 Might be a weed or a wildflower. But it looked nice in the afternoon sunlight. And in the backyard, there were tons of poppies and phacelia. A new renter has been found and she's very excited about the garden. Seems it was one of the main reasons she wanted to live there. So that makes me happy. And Happy bloom day to you all. Thanks to Carol at May Dreams Garden for hosting this great excuse to get out and take pics of our gardens. 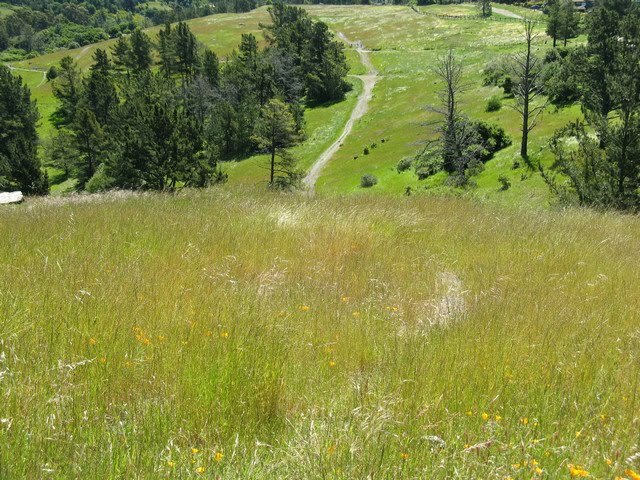 So what did California look like before massive development and the upheaval of introduced species of flora? Is there anyway to get a glimpse into the past? 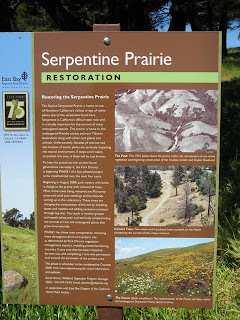 Well it so happens that areas with serpentine soil often still contain many native plants and haven't been crowded out by invasives. Many of our plants evolved to grow in serpentine soils and so, for once, have an advantage over exotic species. Between gardens during the natives tour, I drove along Skyline Blvd in the Oakland hills. 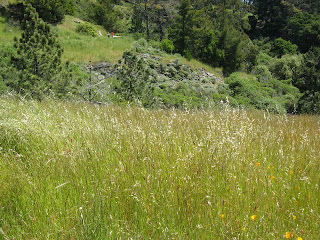 I saw a stretch of grasses and wildflowers between the north and south lanes that caught my attention. 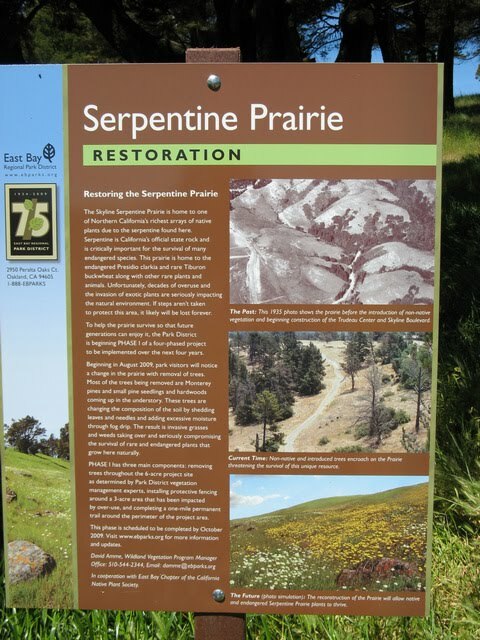 My partner's father the day before had mentioned going to the serpentine prairie with the dog and I wondered if this was it. Interesting, but it seemed awfully small. 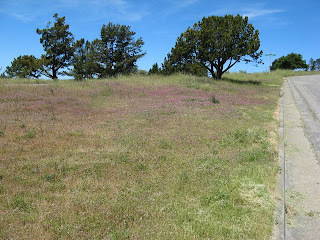 I was still impressed with the native grasses, flowers (lupine, poppies, owl's clover), etc. 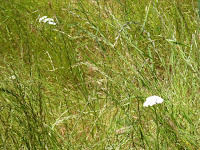 growing in a median strip. But I went on my way and then saw what he was talking about. The restoration will continue over the next couple of years and the idea is that hopefully they can restore it to its former glory. Here's hoping they are successful. So I also went to the CA native Bee Garden at UC Berkeley as part of the Bringing Back the Natives Tour (see my previous post). I had been two years ago, and probably wouldn't have gone again if my cousin, Marissa, wasn't working there. I ran into Marissa on the tour there 2 years ago, not knowing she was helping her professor do native bee research. And now that she's graduated she has a job doing research. Not sure which species this is. 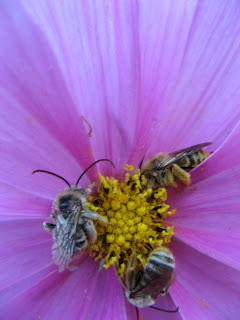 They were sleeping on a cosmos bloom last year. It might be Melissodes robustior (males). None of our native bees live in hives. The bees you see this year actually emerge from nests that were laid last year by solitary females. The male bees tend to hatch a few days earlier than the females and then stake out some flowers and patrol them, either to protect a nectar/pollen source for females of their own species, or more importantly to mate with a female who will (hopefully) visit those flowers looking for pollen or nectar. If you see a bee zooming around and around a particular patch of flowers, you're looking at a male. Females will come to gather pollen and go back to their nest. The guys want to cruise and the ladies are all business. And only the females can sting. Stingers are modified ovipositors, which males don't have. Most native bees dig holes into the ground to make their nests, so don't mulch your whole yard. 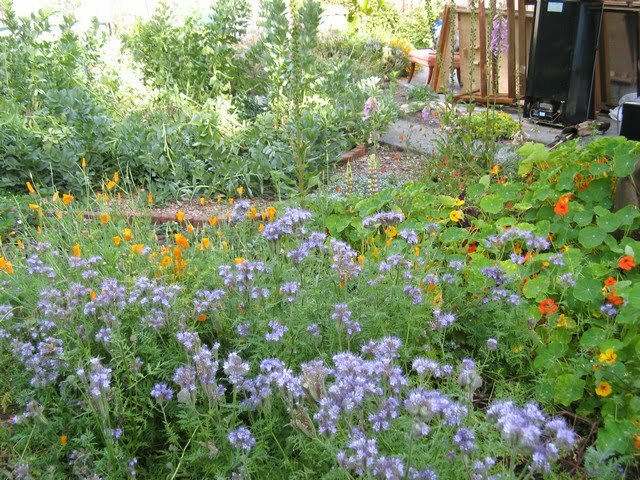 Leave some areas unmulched to provide nesting habitats for the bees. Some will dig a vertical shaft down and then dig out horizontally in a spoke-like pattern to create individual cells for each egg. Each cell is lined with a waterproof coating and each egg is laid with with a bit of bee bread, a mix of pollen, nectar and bee saliva. They then hatch, eat, grow, and then go dormant to stay underground until the following year. Many of our species of native bees only come out into the open for a few weeks. They mate, the females build their nests and then die. 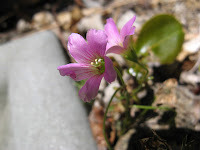 Their emergence from underground is often timed to match the blooms of favorite species. 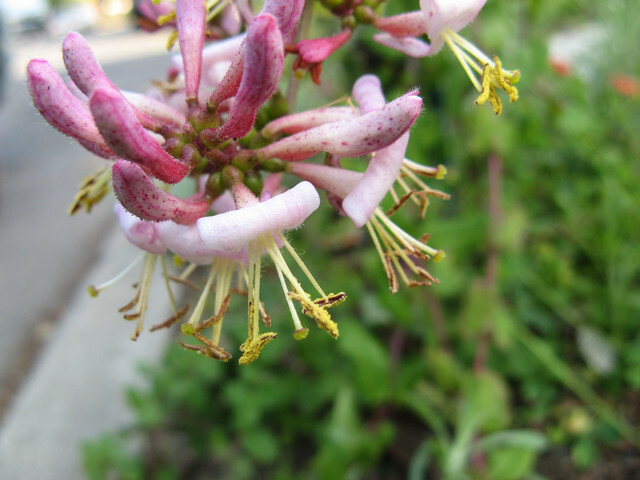 There are approximately 1600 species of bees (mostly native) in California. This is an amazing number considering the US has about 4000 species total and there are an estimated 25,000 in the world. And our adult bees vary in color and in size from the size of a grain of rice to big furry ones the size of bumblebees (very different) or bigger. We have leafcutter bees (Megachilidae family, which I've seen in my own garden), headbonker bees (Anthidium sp. 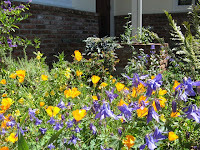 ), carpenter bees and green sweat bees. The leafcutters cut pieces off of leaves to help build their nests. 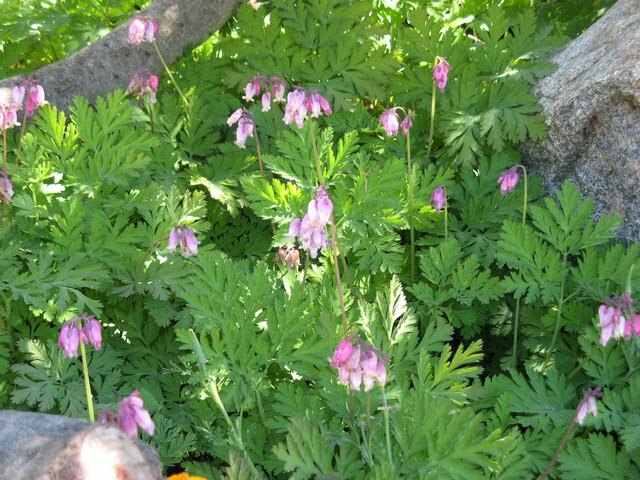 Headbonkers are called that because the males pick a plant and guard it. They will actually bonk bees off the flowers to protect the nectar and pollen for themselves or their females. The blue orchard bee (Osmia sp.) 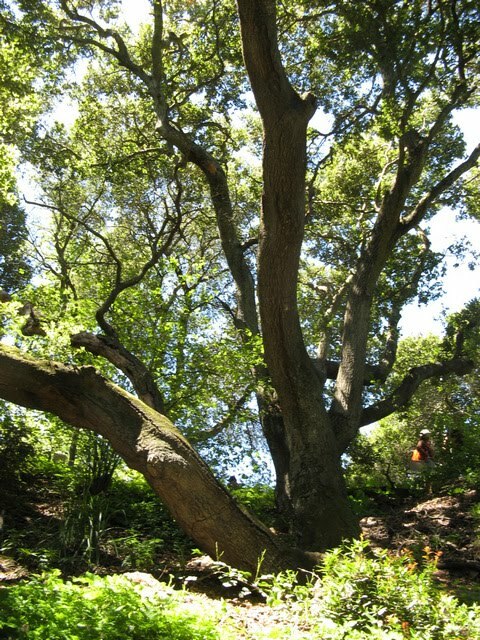 and some other species live in tunnels found in old wood (preferably oaks). So at the garden the researchers drill holes into blocks of wood of varying widths to attract bees to nest in them. Since the young bees stay in the nest until the following year, the blocks can be transported to a new area. Because of this and of CCD (Colony Collapse Disorder) affecting honeybees, these bees are being used more frequently for agriculture. 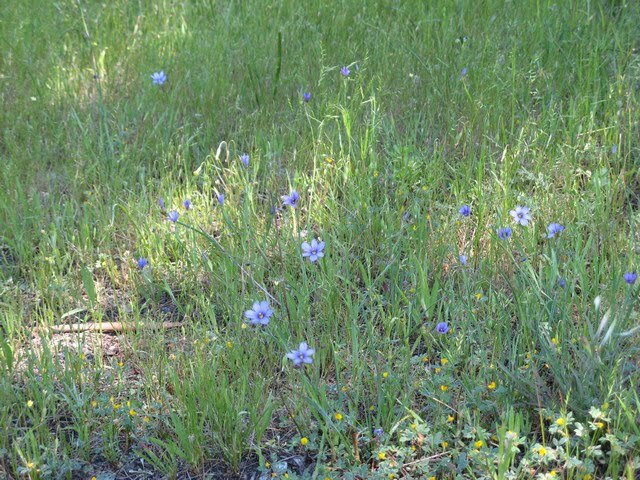 And most importantly native CA bees prefer native CA plants. 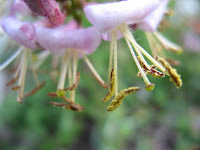 They will also gather pollen and nectar from some non-natives, and the bee garden is doing research to see what plants are useful resources for bees, but in general they prefer the plants they have co-evolved with. Go figure. 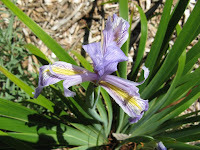 For more info and pics on individual species at the garden check out this article at baynature.org. And also here is the list of plants from the garden with details about which bees they attract and some planting advice. 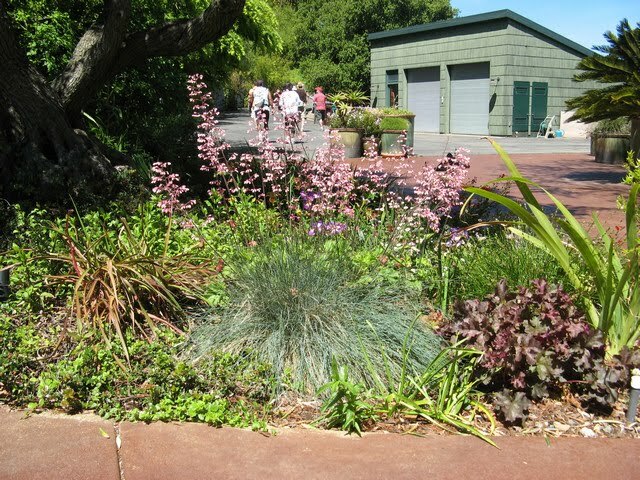 So today was the "Bringing Back the Natives Garden Tour" here in the East Bay. I debated about whether to go or not. I've been the last 3 years and have seen quite the mixed bag of gardens. 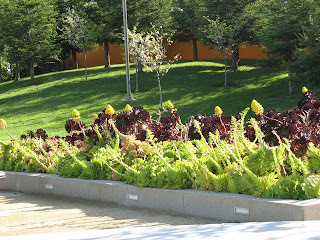 But I drove out to Castro Valley to pick up a new kitchen table this morning and, on my way home, was going to pass two gardens in the Oakland hills I was interested in seeing, so I decided to stop by. And I'm really glad I did. 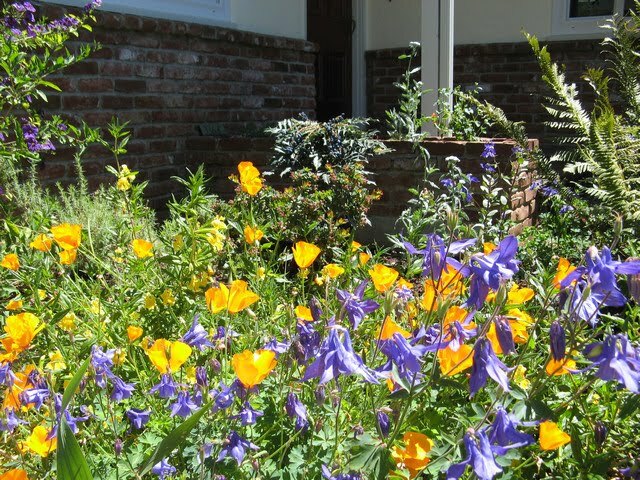 Both were larger gardens touching some open space and so are not your typical home gardens, but they are perfect places to showcase the beauty of California natives. 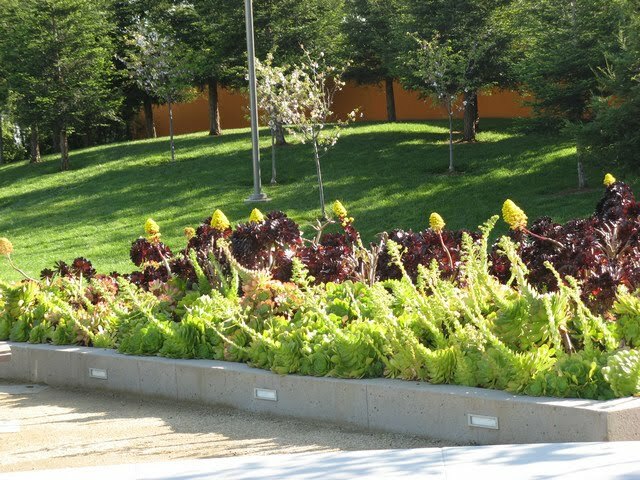 The first garden I saw was the Baird/Harper garden, sitting on 5 acres overlooking East Bay regional parks and open space. 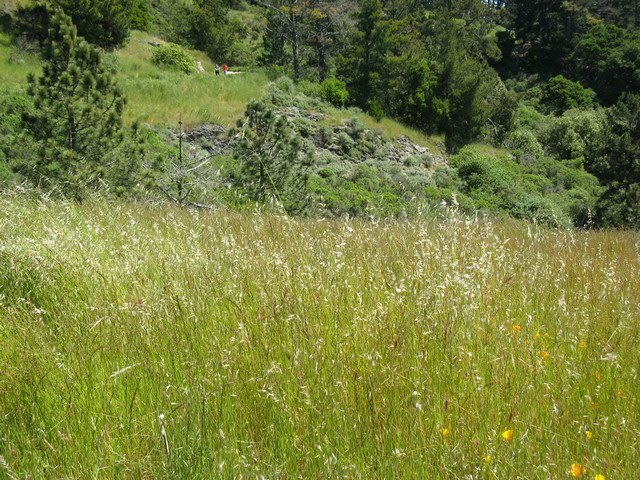 The views were amazing and property had an amazing variety of California natives, most of them native to the East Bay. 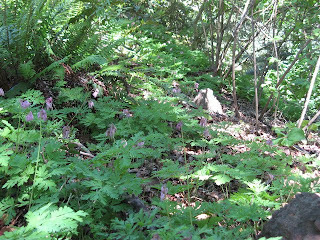 The oak/bay woodland above the driveway was full of different natives and was very lush. 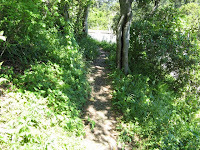 There was a narrow trail winding through it, so it gave the effect of hiking in an ideal, lush part of the East Bay. (Part of it received some irrigation). 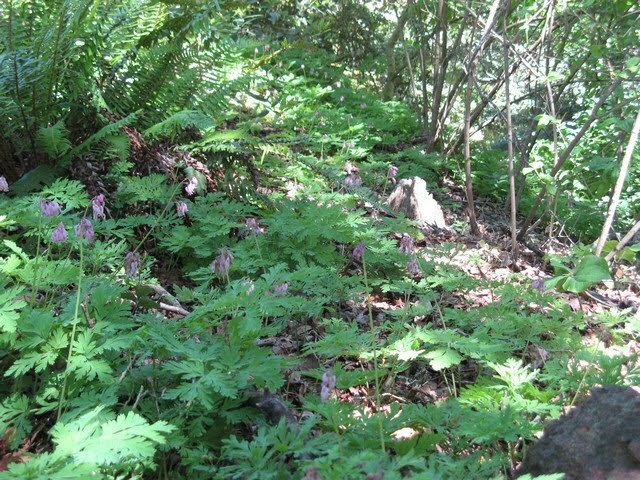 There were ferns, iris, wood mint, wood rose, miners' lettuce, yerba buena, lots of scrophularia, and many other plants. This area is nice for someone who enjoys a more wild look. The area around the pool had a more controlled garden design. It incorporated exotics and some Ca natives, including various Pacific Coast Hybrid irises and a really beautiful ceanothus with dark purple flowers. There was also this heuchera that looks like it's blooming from a Festuca idahoensis. 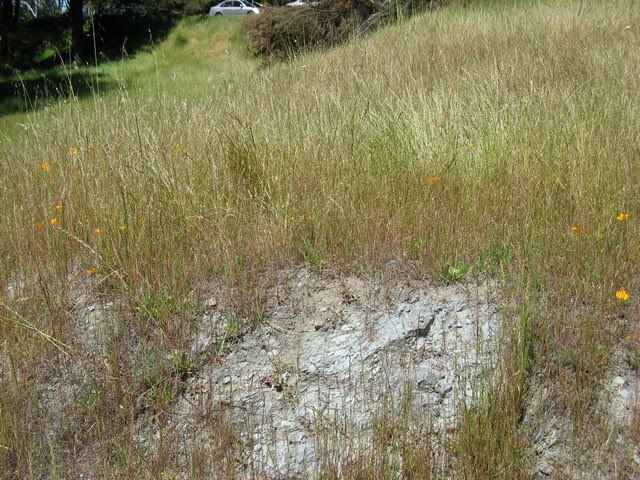 I also went down to a dry creek bed they are trying to get under control. They pulled out a bunch of weeds and then planted some sword (?) ferns. I then hiked down the hillside to a small creek. This area had only limited, if any, work done on it. 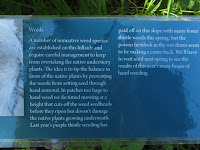 There were still a lot of natives to be seen, and of course some weeds, including the hemlock they were battling above. 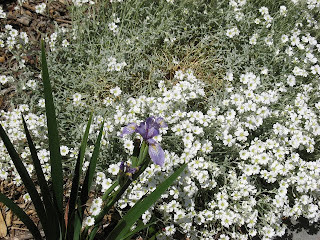 The second garden I saw was actually two adjacent yards owned by sisters, Sue and Cherie. If the first garden had an lush wild look, these gardens had more of a pleasant, tamed wildness to them. I could easily see sitting just enjoying this yard for a long, long time. These houses are just down the street from where my partner grew up, and I spoke for a while with one of the sisters. She was very friendly and welcoming, and she knew Mike's parents. Here are some pics from her front yard. 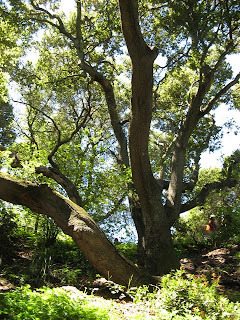 The yards are under some incredible oak trees on a slope overlooking Butters Canyon (a tributary of Peralta Creek). The neighborhood has a land trust, the Butters Canyon Conservancy to try and preserve as much of the creek as possible. They have been buying some of the undeveloped lots to keep it as open space. Hopefully I'll have another post soon on their efforts. I also went to a third garden, the UC Native Bee Garden where my cousin is helping doing research. I'll post more about that next time. And be sure to click on the links above for more pics of the gardens.